Start your morning with a calming yoga class, followed by a hearty poke bowl for breakfast before joining a cake decoration session. You can also get your weekly haul of artisanal products from Ripe Market every Tuesday. Now your family can do all of that under one roof at City Centre Me’aisam. Back by popular demand, the community-oriented lifestyle destination’s hugely successful leisure and F&B pop up ‘The Backyard’ will open on November 15 and run until December 15. Reminiscent of a warm, relaxing outdoor oasis, ‘The Backyard’ will be a lively space at the mall where families and friends can gather for a good time and riveting conversations over comfort food, shopping, exciting workshops, buzzing markets and kids’ activities. The mall has transformed a 470 sqm space into a fun picnic spot with an eye-catching design. Artificial grass, communal tables, exciting pop up eateries, and evocative murals and installations of bicycles and butterflies bring the outdoors indoors, giving visitors great hashtag moments for social media. Every day for a month, ‘The Backyard’ will come alive with a food fiesta, cake decoration, and fitness classes for adults; edutainment workshops and a soft playing zone for kids, as well as a Ripe Market on Tuesdays. The pop up also aims to expand the retail offerings for the community, through collaborations with exciting new retailers, such as French furniture and home décor company Maison du Monde and children’s doll brand American Girl. Majid Al Futtaim has launched the popular community initiative Ripe Market for the first time at its mall as part of ‘The Backyard’. The craft and artisanal goods market will lay out the unique handcrafted products made in the UAE for the community every Tuesday until December 15. There is never a dull moment for the mall’s young visitors at ‘The Backyard’. A special kids’ corner has been designed with slides and a playhouse, colourful seating, and attractive motifs. Parents can drop off their kids carefree in the supervised area for one of the several exciting edutainment sessions that will be scheduled throughout the month. From martial arts and robotics classes to plant potting, drumming and pizza making classes by 800 Degrees Pizza, ‘The Backyard’ is the perfect free-to-attend after-school club to keep them engaged. Spend some quality time with your best friends while learning the art of cake decoration by GOSSIP Café and Desserts or learn the basics of baking bread and desserts only at ‘The Backyard’ this month. The mall will be hosting activities for parents to make their mornings special, including painting and floral arrangement classes and upcycling sessions where participants can turn their unwanted products and material into environment-friendly decorative pieces and wall hangings. If you are participating in the Dubai Fitness Challenge, then get daily active minutes at ‘The Backyard’ this month. The mall has organised yoga and Pilates sessions for participants to stay active and energised all day. The food bowl trend is here to stay. ‘The Backyard’ has brought this Instagram-able rage in collaboration with the famous Poke Poke restaurant. This Hawaiian-inspired healthy salad bowl can be customised with your choice of protein with rice and vegetables, along with their signature recipe, which includes truffle infused mixes and spiced nuts. Freshii will also be offering a menu of salads, burritos, wraps, rice bowls, yogurts and breakfast for ‘The Backyard’ visitors to munch on after one of their workshops or fitness classes. Dessert lovers will be drawn to the milk cakes and buttercream at GOSSIP Café and Desserts. Offering a visually exciting dining experience, the café puts an Emirati twist to contemporary American dishes, using only the highest quality natural and organic ingredients. Visitors can shop at exciting new stores for a limited period at the ‘The Backyard’. Expanding the retail offerings for the community for a month, City Centre Me’aisam has collaborated with French furniture and home décor company Maison du Monde and doll company American Girl to provide selected pieces from their latest collections at the pop up. 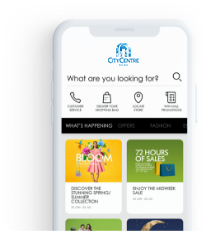 Don’t forget to tag #citycentremeaisem to all your ‘The Backyard’ experiences on social media.